Mechanical integration: For an efficient mechanical integration consideration has to be given to available fixtures, orientation of instruments relative to the platform, weight and dimensional limitations, possible changes of the vehicle kinematics and the preservation of the mechanical integrity due to the added scientific payload. Simple planning tools exist to realize the process and it will be investigated on how to improve these tools to facilitate the integration process. Sensor interfacing: Due to the fact that a large variety of sensors are required to adequately investigate planetary and ocean environments, interfacing of different sensor needs to be improved. We will evaluate and test existing interface standards and develop practical guidelines for interfacing where standards cannot be applied. As an example the so called Sensor Web Enablement standard developed to support satellite observations of the earth was successfully tested also in the ocean environment and helped in structuring the data collection process. Power interfacing: In particular for autonomous systems power is limited and overrating available resources may lead to significant losses up to complete outages. Careful evaluation of the power consumption profile is needed to ensure reliable operation of the complete system. A systematic approach of describing power requirements is necessary for integration of scientific payload systems. Communication interfaces: The variety of platforms and systems are requiring a large flexibility in regard to communication capabilities. While in space sciences electromagnetic communication is pervasive, in ocean sciences acoustic communication is a common method to remotely interrogate deployed systems. Similar issues occur in regard to long transmission latencies which have to be addressed with proper data protocols. This is an area of synergies between ocean and space sciences which shall be explored. Specific issues can show up in the different fields when it comes to enhancing data throughput and bandwidth. Here the differences in the communication medium will call for specific approaches. Mediation between sensor requirements and platform capabilities: User and operator of instrument platforms have differing perspectives on the instrument integration process. There may be conflicting requirements for instance in regard to power needs and availability. Strategies like adaptive power management have to be found to identify trade-offs. Experience on that will be collected and compared and new strategies shall be developed. Control of integration process: To ensure maximum reliability on the integration process every step has to be checked to be able to guarantee the proper operation of the added instrument. Best practices have been developed for that and shall be evaluated in a systematic way. 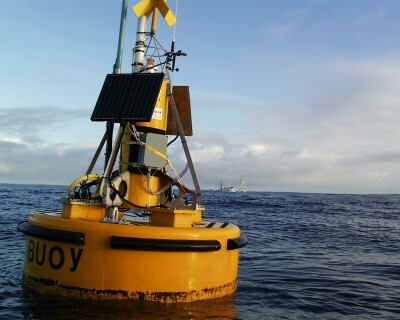 © MARUM | Buoy on position northwest of Gran Canaria. Besides submersed sensors atmospheric measurements are taken.